Fairy tales and folktales have served as fertile ground for many stories, novels, cartoons, movies, and games. They speak to common ï¿½ possibly timeless ï¿½ human emotional concerns. Despite being retold again and again until they are clichï¿½ and their images instantly familiar, something about fairytales always remains fresh and new, speaking expressively to even long-familiar readers or hearers. Fairytales unite the ordinary and the extraordinary in stories full of magic, wonder, and moral lessons. Flavor, killer apps, excellent example and instruction, and sheer mood blend with the kind of heart, love, and optimism that quite frankly we need right about now, in gaming and everywhere else. 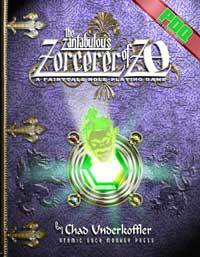 For all these reasons, and for the sheer giddy delight of an Oz-Narnia mashup, Chad Underkoffler gets the ruby slipper for The Zorcerer of Zo, along with the 2006 Best New RPG Outie. :: Tales of Zo, a collection of Zo-based fairy tales by Chad Underkoffler and other authors, available from Amazon in Kindle ($3.99) or softcover ($11.69) formats (213 pages).